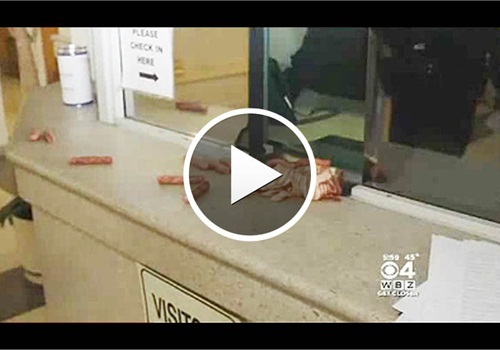 A woman who allegedly walked into the Framingham, Mass., police station, declared she was there "to feed the pigs" and then smeared raw pork products all over the lobby window will undergo a mental health evaluation, authorities said, reports the Boston Herald. When a Framingham police officer working the front desk the day after Christmas asked if he could help her, Lindsey McNamara, 24, of Ashland responded: "Yeah, I'm here to feed the pigs," according to a police report. McNamara then reached into the Dunkin' Donuts box she was carrying, grabbed handfuls of raw bacon and sausage and began smearing them all over the window. She was immediately arrested and charged with disorderly conduct and malicious destruction of property worth less than $250. Asked by the officer why she did it, McNamara said: "God told me to go feed the pigs," according to the police report.